Stockholm is definitely not famous for its museums, but there are many museums, galleries and permanent exhibitions, not that you can see around the city, where discover the history, or simply admire works of art. To discover the city’s history and Swedish culture simply visit the Historiska Museum, Nordiska Museum, dedicated to the history and traditions, or the Vasa Museum, which contains a galleon of 1600. 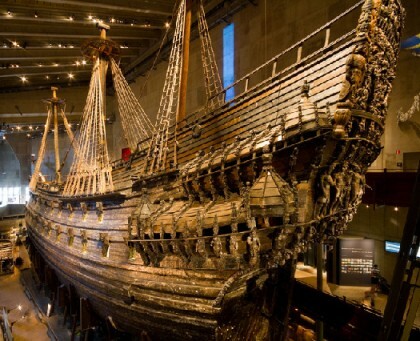 The latter was built and dedicated to a galleon that sank a few miles from the port of Stockholm on the day of its launch, remaining stranded at sea for centuries before being recovered almost entirely and transported to the museum in the 60s. In Vasamuseet you can watch it in a way that illustrates the history and characteristics. The museum is open from January 2 to May 31 and from September 1 to December 30 from 10 to 17 (Wednesday from 10 to 20), from 1 June to 31 August from 08:30 to 18, tickets cost 110 kr. To admire the Swedish art and design is a must to visit the National Museum, where only the top floor is dedicated to painting and sculpture by Flemish artists, French and Swedish, while for the rest you can discover the history of Swedish design. The Modern Museum, finally, contains both Swedish and international contemporary art in the permanent and temporary exhibitions that are renewed monthly.